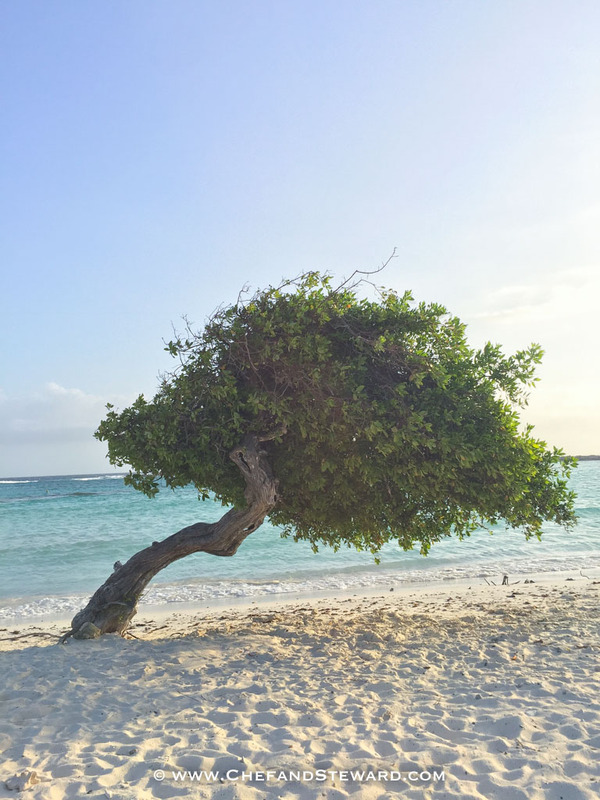 Since moving to Aruba, there were lots of adjustments. The food scene here is quite active with dining out being part of the culture for locals, expats and tourists. As much as I have tasted, there was one thing i was really missing- goat (“cabrito “as it is called here). That issue was solved and I have recently been feasting on goat from three places. 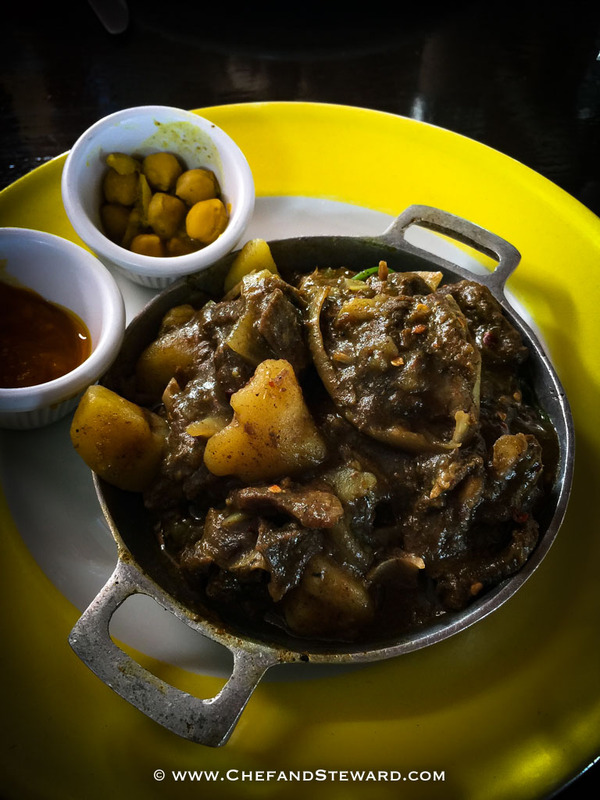 Here is the first- a lovely little casual family restaurant by a Trinidadian lady called Kamina. In Aruba, you will find that the vast majority of stand alone restaurants are actually named for people. We recently wrote about our experience at Matthew’s. Here was our fourth trip to Kamina’s. As you know, I prefer to have at least two visits before writing a review. The issue with me and this review is that I have only had the curry and roti. It was an intense itch that needed to be scratched, and though the whole fried fish on the menu looks equally delicious, well it wasn’t the Caribbean curry that I was yearning for so we pretty much stuck to curry. 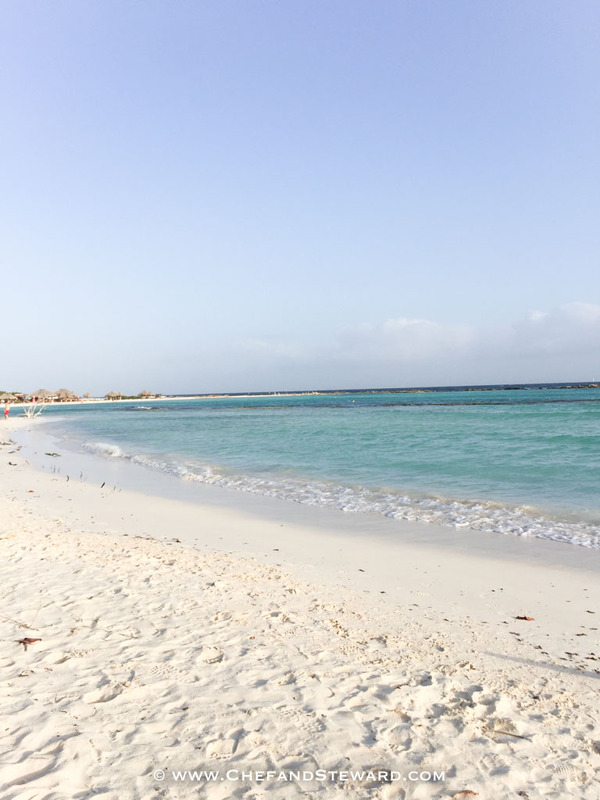 If you have been to Aruba and gone out to Baby Beach, it is quite a lovely drive from the north to the south of the 19km long island. Just after passing that house with the sign “Train Museum,” you will see a bright green building with large windows. That is Kaminis. It makes it the perfect stop on the way to the beach. We’ll get back to the beach later. Lets talk about the food. The curry is served with complimentary pumpkin paste and curried chickpeas (channa) but you have to ask for them now because people have been throwing them away so they only serve them if you ask for them. Each portion comes into cute little tiny Dutch ovens and a single roti. 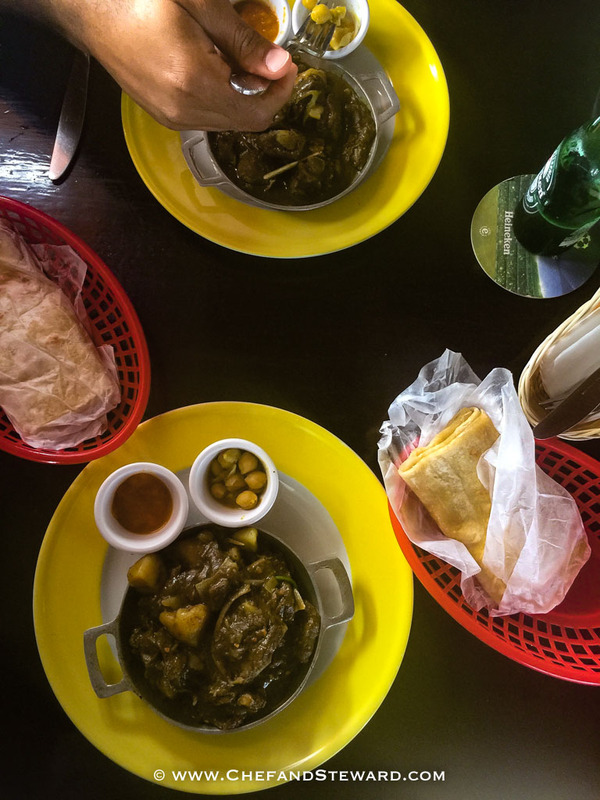 I have been to Trinidad twice and I know Trinidadian curry, both in the home and from popular streefood joints like Patraj Roti. If you are looking for a spicy curry, this is not it. Shadow beni is hard to find in Aruba and is replaced with it’s relative, cilantro. All in all, a really tasty dish. So much so that we have made a total of four trips. The roti is incredibly moreish as well. Try eating one only. On two trips we ordered the prawn curry with roti as well but only took photos on one trip. The shrimp curry is scrumptious. The only thing I really missed was having a spicy Trini chutney on the side with the curries. 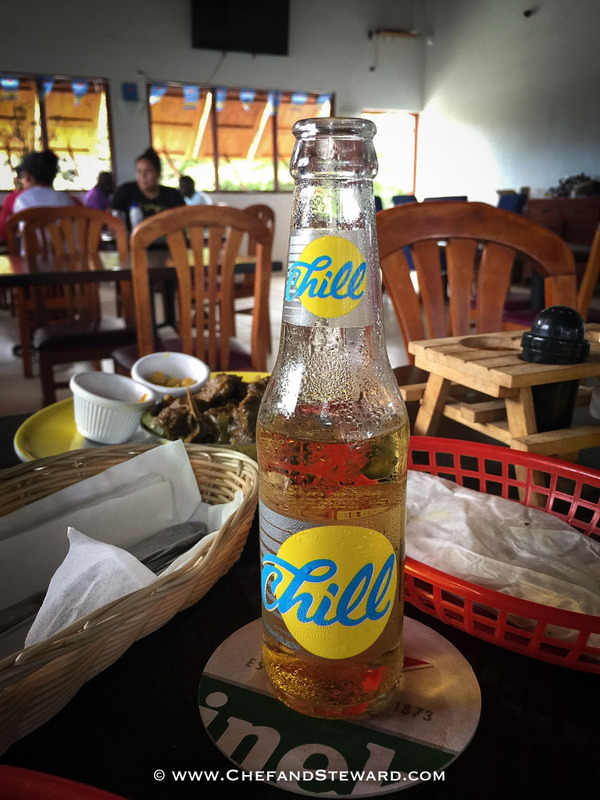 This local Aruban light and bright brew is our favourite beer these days. We are pretty light on alcohol period. Chef Lij is usually a Heineken man (and ordered one to start but since then, has been ordering Chill too. It’s almost like a Shandy on a hot sunny day. I would suggest you asking for extra spice in your curry like I did (note the pepper seeds). Curry aint curry without a little heat. I prefer my sinuses to clear up after eating curry. The heat definitely packs up a punch in the flavor profile. 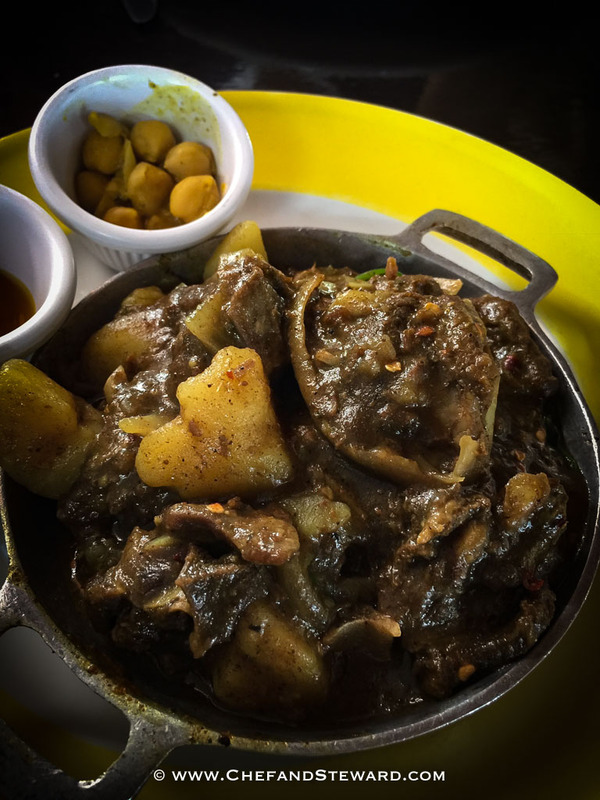 This restaurant has also helped me to make our little one like curry goat and roti. He has been so many times and I order the same thing for him. The thing is that we hardly ever order the kids meal in a restaurant as it often not real food. We prefer little one to eat heartily as much as possible. And I definetly wanted him to love curry as much as we do so we never order anything else for him. 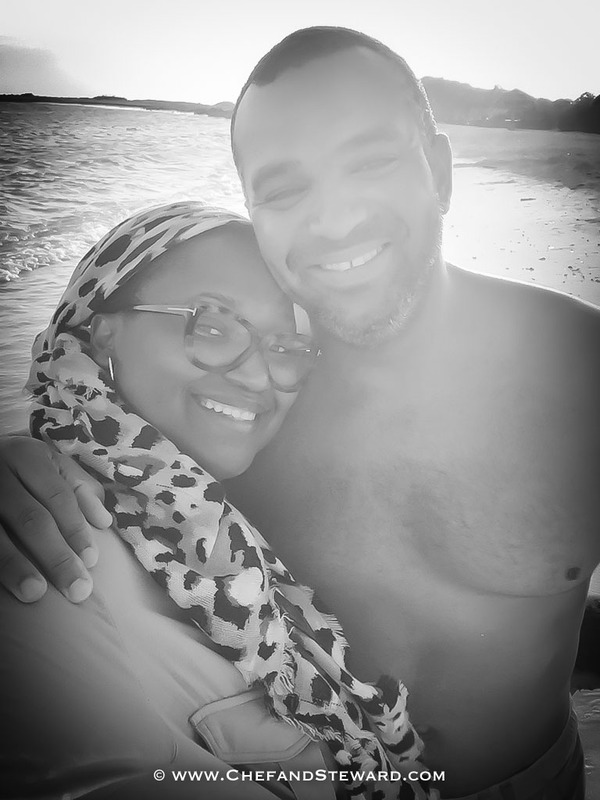 I just try not to take him in his really good clothes and if the curry catches his clothes, simply wash it out with dishwashing liquid immediately upon returning home (or to your hotel). We have never had room for dessert at Kamina’s. Unless you call an extra roti dessert. After eating 1 1/2 of those bad boys, you are pretty much ready for a siesta…. 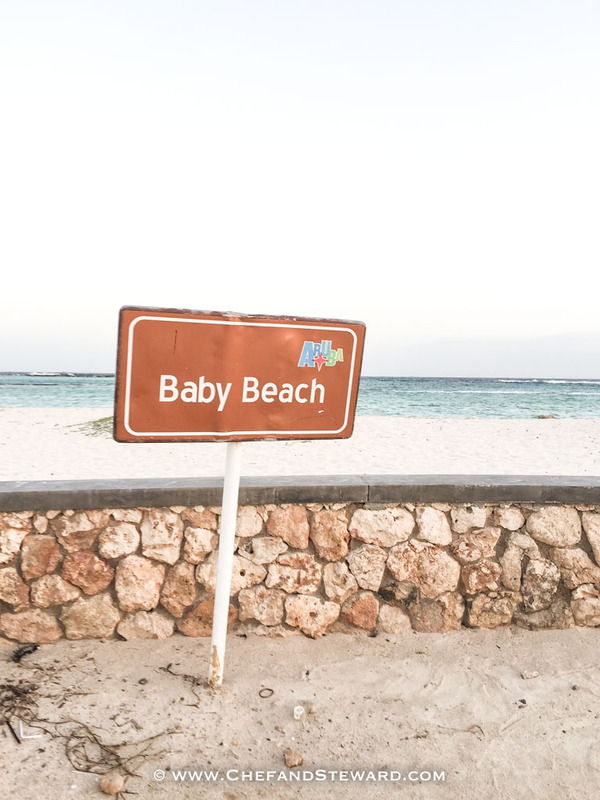 and that’s when you head to Baby Beach. 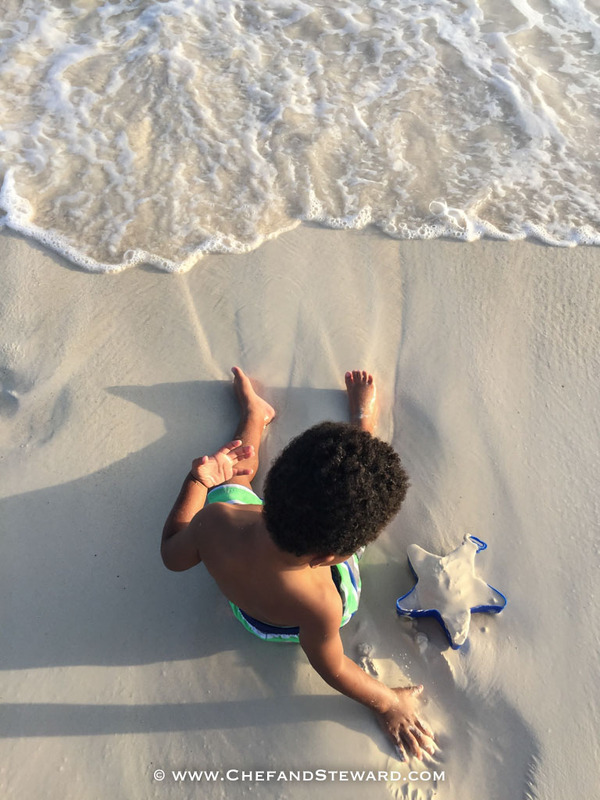 After all that yumminess, a walk along the beach or a paddle is a must. Certainly walk with swimming costumes especially for the kids and beach toys as well. Within an hour, they will be worn our from the food and beach play. And that is magic to every parent’s ear! And enjoy the simple life. Let us know if you have been to Kamini’s and what are some of the things you like to eat there. Other restaurant suggestions also welcome. I grew up in Aruba, 62-70 and am returning there the last week in June with my family. Do you have any other restaurants you can recommend…good, local, non-hotel/tourist type? 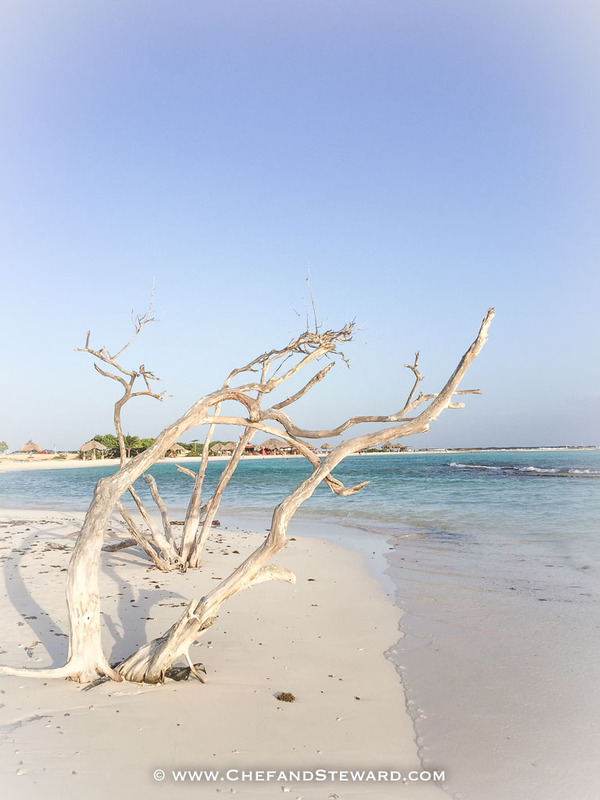 Hi, Bon Bini to our blog! Yes loads! Its a long time since I read your page. I really miss reading it. Khari your piece for your mother was wonderful. 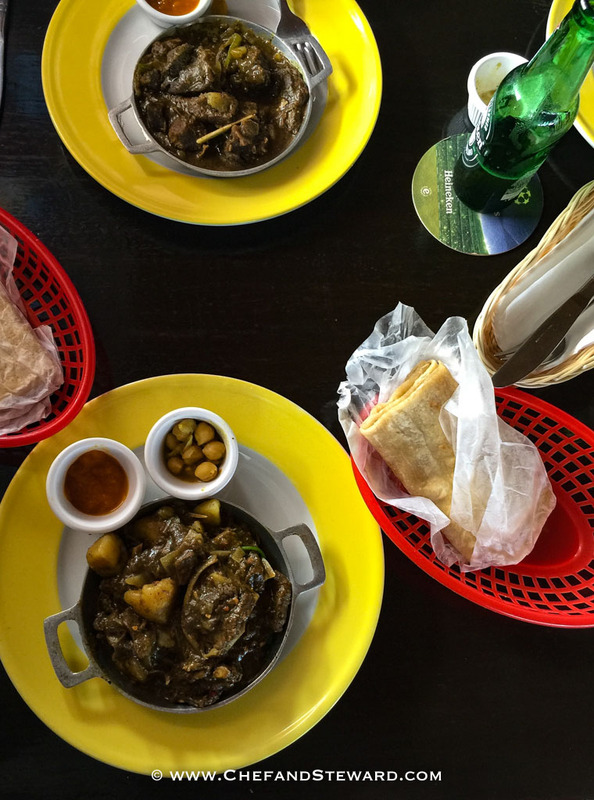 I wonder if the curry goat in Aruba tastes as good as the Jamaican one.